This brief contains a correction. People do better when more is expected of them. In education circles, this is called the Pygmalion Effect. It has been demonstrated in study after study, and the results can sometimes be quite significant. In one research project, for instance, teacher expectations of a pre-schooler’s ability was a robust predictor of the child’s high school GPA. Raising student expectations has been in the news a lot recently as part of a larger conversation about improving learning outcomes. Most notably, a group of states have developed the Common Core State Standards, which go a long way toward establishing higher standards by setting out what students should know and be able to accomplish in reading and math. More than 40 states have adopted the standards so far. Recently, however, there has been a great deal of political pushback against them; a number of states, including Oklahoma, recently abandoned the reform effort. To look at the issue of expectations more closely, we analyzed the National Center for Education Statistics’ Education Longitudinal Study, or ELS, which followed the progression of a nationally representative sample of 10th grade students from 2002 to 2012. The ELS has a longitudinal design, which allows researchers to link teacher expectations to individual student data collected up to 10 years later. For some findings, we conducted a logistic regression of students’ actual academic outcomes on teachers’ expectations. In other areas, we reported simple frequencies. High school students whose teachers have higher expectations about their future success are far more likely to graduate from college. All else equal, 10th grade students who had teachers with higher expectations were more than three times more likely to graduate from college than students who had teachers with lower expectations. In other words, the expectations of teachers showed a very strong predictive relationship with college graduation rates. It cannot be said for sure that teacher expectations boosted college graduation rates. It is also possible that teachers with lower expectations were more likely to teach traditionally disadvantaged students who are less likely to succeed in colleges. It is also possible that teachers might simply be very good at figuring out who will graduate from college, regardless of the students they teach. Secondary teachers have lower expectations for students of color and students from disadvantaged backgrounds. Secondary teachers predicted that high-poverty students were 53 percent less likely to earn a college diploma than their more affluent peers. They also believed that African American students were 47 percent less likely to graduate from college than their white peers. Finally, they believed that Hispanic students were 42 percent less likely to earn a college diploma than their white peers. There is no doubt a significant methodological issue here, and teacher expectations of disadvantaged students might simply reflect those students’ lower levels of academic achievement. Put more simply, educators’ expectations might simply be a mirror of the broader problems of the nation’s education system. College-preparation programs and other factors that support higher expectations are significant predictors of college graduation rates. High school students who enroll in college-preparation programs are more likely to graduate from college—all else equal—as are students who indicate that they work hard in high school. In short, students who have more rigorous academic opportunities and experiences—including opportunities to practice and gain knowledge—are more likely to succeed academically. Expectations also often have long-term effects. For example, education researchers in the Netherlands found that biased teacher expectations at the end of primary school predicted secondary school outcomes. Psychologists from the University of Michigan and Rutgers University concluded that teacher expectations can predict student achievement for years. Specifically, they found that teacher expectations in sixth and seventh grade predicted student achievement six years later. Teachers themselves also say that high expectations are important for student achievement. According to the most recent data available—a 2009 MetLife survey with a nationally representative sample of more than 1,000 K-12 teachers—86 percent of teachers say that there is a strong relationship between having “high expectations for all students” and student learning. But when it comes to actual expectations for students, only 36 percent of teachers say that “all of their students” can achieve academic success. The MetLife survey also revealed that only 13 percent of teachers “believe that all of their students are motivated to succeed academically.” It seems, then, that teachers think that high expectations are important, but they are not always confident that everyone in their classrooms can achieve academic success. As noted above, the ELS follows students over time. Several studies have used ELS data to investigate teacher expectation effects. To our knowledge, however, no other studies have examined the link between teacher expectations and future educational attainment using both the ELS data collected in 2002 and a new wave of data released in February 2014. We hope to add to the research knowledge by attempting to answer the following question: Can 10th grade teachers’ expectations predict students’ college completion? The survey asked teachers to predict “how far in school … you expect this student to get,” including high school, college, and beyond. We also looked at other factors that affect students’ chances of graduating from college, including their race, academic effort and motivations, and high school coursetaking patterns. We also included their parents’ expectations for their educational trajectory as well as their own expectations. Notably, even after accounting for other factors, teachers’ expectations and students’ college-going outcomes had a significant relationship, and teacher expectations were tremendously predictive of student college completion rates. In fact, after controlling for student demographics, teacher expectations were more predictive of college success than many major factors, including student motivation and student effort. These findings build on other research that suggests teacher expectations are powerful predictors of future success. For instance, researchers from the University of Virginia and Rutgers University used the ELS data to determine if college-attendance expectations made while students were in 10th grade could predict if students would still be in college four years later. The researchers found that of three groups—students, parents, and teachers—teacher expectations were more powerful predictors of postsecondary education status than the expectations of students and parents. They also found, however, that “teachers had the lowest expectations” for students. Our results extend this finding by showing that not only can teachers predict who goes to college, but they can also predict who graduates. While it is clear that expectations matter, our study also found that teachers have far lower expectations for students who might need high expectations and support the most. For instance, some secondary teachers believe that students of color and students from high-poverty backgrounds are far less likely to complete college. As noted above, the data set does not allow for a conclusive interpretation of why this occurs, and it is possible that teachers are simply making accurate predications given previous performance. In other words, one cannot rule out the possibility that teacher accuracy, rather than influence, can explain the predictive nature of teacher expectations for students’ academic outcomes. There are other reasons for caution here as well, as teacher expectations can be very subjective. Researchers from the University of North Carolina at Greensboro conducted a longitudinal study of almost 1,000 elementary school students and reported that teachers had higher expectations for the reading achievement of girls than boys. 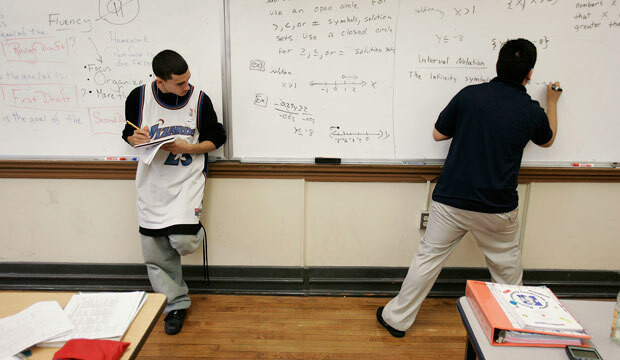 Researchers have also found that teachers’ perceptions of student effort predicted math grades with teachers giving higher grades to students they perceived to be hardworking, even though the students given lower grades said that they worked additional hours at home on their academics. What is clear, however, is that social stereotypes can play a crucial role as teachers build assumptions about their students and their future performance. A growing body of research shows that some teachers have low expectations for low-income students and students of color. It is also clear that more rigorous coursework and other experiences in high school make it more likely for students to succeed in college. Other studies support this finding, showing that teachers tend to expect more of students in higher academic tracks. Furthermore, more rigorous classes typically entails harder coursework, which helps students better prepare for college. Looking forward, the research outlined here suggests that policymakers must continue to raise expectations for students. The Common Core State Standards are one of the most powerful ways to do so, and states and districts should continue to support them. In particular, education leaders need to pay attention to the standards’ implementation to ensure that they create higher expectations for students. At the same time, the data suggest that more needs to be done to improve teacher instructional capacity. As a series of reports by the National Council on Teacher Quality, or NCTQ, have demonstrated, teachers do not get the rigorous training they need. In particular, NCTQ has found that some teacher prep programs do not do enough to give teachers hands-on training in high-performing, high-poverty schools. Other research shows that even before entering the classroom, some teachers have low expectations for low-income students of color. It is therefore critical for teacher-preparation programs to communicate to aspiring teachers the importance of having high expectations for all students. In short, the United States needs to raise its expectations for students—as well as educators. The Pygmalion Effect can go a long way toward helping our children succeed in college and in life. Ulrich Boser is a Senior Fellow at the Center for American Progress. Megan Wilhelm is a sociology graduate student at the University of Maryland, College Park. Robert Hanna is a Senior Policy Analyst at the Center. *Correction, October 7, 2014: This brief has been corrected to better reflect the role of self-fulfilling prophecies in student performance. The brief’s subtitle has also been updated, endnote 1 was updated, and endnote 19 was added.